If you search for Me with all your heart, you will find Me. when you shall search for me with all your heart. When my children were young, one of the games that I would play with them was called 'hide and seek'. I would hide and then they would try to find me. The game is pretty simple and lots of fun. The whole point of this exercise was that they would eventually find me... and that was the best part! I would never have thought to try and hide myself so thoroughly that my children could never find me. That would not have been fun at all, for the real joy was in them finding me. I don't think our Heavenly Father is much different, though His ways are way higher than my ways for sure! He absolutely delights when we seek Him with all our heart and He loves to be found by us! 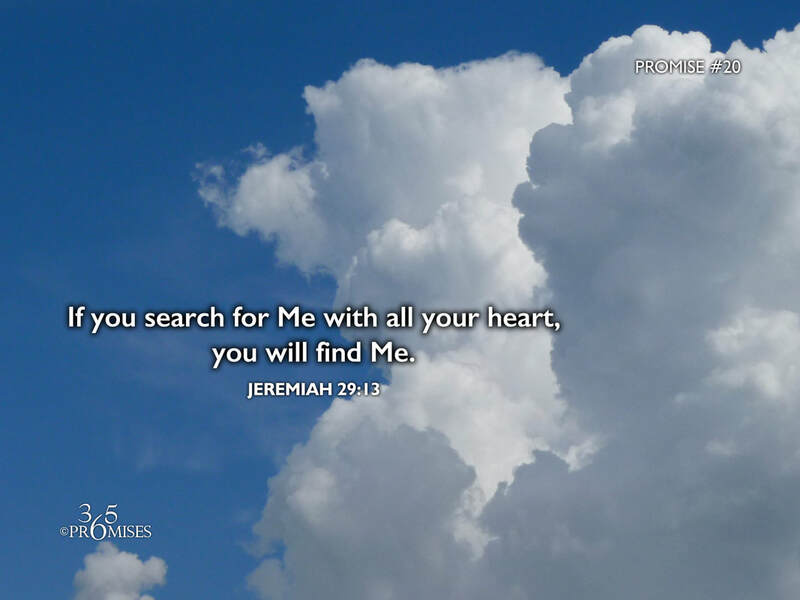 Today's promise tells us that we will indeed find Him when we search for Him with all our heart. If you are feeling discouraged today, hungry for God but somehow feeling that you have not yet apprehended Him, don't give up. Keep seeking. Keep knocking on the door. Keep on asking. He promises to be found by you!